Throughout the twentieth century socialism and war were intimately connected. The unprecedented upheavals wrought by the two world wars and the Great Depression provided both opportunity and impetus for a variety of socialist experiments. 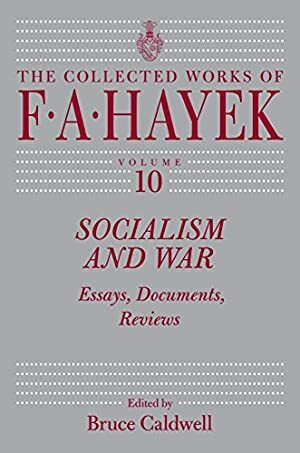 This volume in The Collected Works of F. A. Hayek documents the evolution of Hayek's thought on socialism and war during the dark decades of the 1930s and 1940s. Opening with Hayek's arguments against market socialism, the volume continues with his writings on the economics of war, many in response to the proposals made in John Maynard Keynes's famous pamphlet, How to Pay for the War. The last section presents articles that anticipated The Road to Serfdom, Hayek's classic meditation on the dangers of collectivism. An appendix contains a number of topical book reviews written by Hayek during this crucial period, and a masterful introduction by the volume editor, Bruce Caldwell, sets Hayek's work in context. Socialism and War will interest not just fans of The Road to Serfdom, but anyone concerned with the ongoing debates over the propriety of government intervention in the economy. Log In to track Bruce Caldwell on eReaderIQ. to be notified each time the price drops on any book by Bruce Caldwell. to stop tracking Bruce Caldwell. This book was $35.20 when we started tracking it. The price of this book has changed 123 times in the past 2,207 days. The current price of this book is $11.64 last checked one day ago. This lowest price this book has been offered at in the past year is $11.53. The lowest price to date was $10.71 last reached on November 19, 2015. This book has been $10.71 one time since we started tracking it. The highest price to date was $63.00 last reached on October 9, 2017. This book has been $63.00 one time since we started tracking it. We last verified the price of this book about one day ago. At that time, the price was $11.64. This price is subject to change. The price displayed on the Amazon.com website at the time of purchase is the price you will pay for this book. Please confirm the price before making any purchases.